New Google Maps launched – Shows whole of Kashmir & Arunachal Pradesh as Disputed! Google just announced their New version of Google Map & Earth, which is aimed at providing accurate boundaries and geopolitical features of the country. Google had earlier come under fire for not showing the International boundaries, especially the one’s which are under dispute. They now seem to have taken a safer route by showing regions under dispute separately, which is not part of both the sides. Like in case of India, Google maps has shown entire region of of Kashmir & Arunachal Pradesh to be disputed. According to the new Google maps, all the new areas which are disputed are shown by dotted lines and not part of either of countries which are claiming the region. I, for one can understand Jammu & Kashmir to be shown as disputed (although, I think only northern part should have been show as disputed), seeing Arunachal Pradesh under dispute is not something I can digest. It seems just claiming the neighboring region is reason enough for Google maps to put the area under disputed category. Arunachal Pradesh is an integral part of India and just because China claims it does not mean it should be shown as disputed. Your opinions people ? What do you think ? Using Pre-Paid Connection? Here is how you can get the best deals on recharge..
after reading all comment i just want to say if india needs these parts back from dotted lines than go for a big lose to google . so we can show our attitude to google. Indian govt. should have to decide that not use google . it will be removed from india till they cant do corrections in map. use yahoo and other search sites till correction. india use 30% + google overall. Jammu & Kashmir is disputed area between India & pakistan. Wht the hell, how come google did this. Who has given the permission of deciding which part of country is Disputed and which is not to Google. Please let us know Who…who ??? Google itself taken this authority. Finally Kashmir has been shown as disputed. I thank Google for considering it a disputed territory in it’s maps and I hope that one day it will be shown as an integral part of Pakistan, if Allah wills. Never allah wills, since it is Lord Shiva’s Hills. So far from your statement, i come to know that you are not the representative of Muslim community. I have some regards about muslim. Do you know once upon a time Pakistan was integral Part of India. Still Indian think about Pakistani our brother and sister. You have to know about Indian History and culture before giving such statement. Allah = Indian beloved Gods no difference between them. When Malayalam actress Nithya Das got married to a Kashmiri, govt did not allow them to register their marrriage, means our own government system is not considering Kashmiri as Indian citizen they why you guys are bothering about Google. Tibet is not a disputed land for China anymore, what they did is, bought in million of mainland chinese and intergrated into Tibet and diluted their culture (may be by force..). If India want Kashir as part of it, it has to do what Chinese did on Tibet. Do you think that India Govt. has the guts to do the same in Kashmir? Google did not just recently flip the switch and render Arunachal Pradesh as Disputed. It has been for long that way. You just seem to have noticed it now. The Google India site even now shows AP and J&K as a part of India. The Google China site has for long shown AP a part of China. The fact that China has disputed Arunachal Pradesh for decades is very well known and has been covered many times in news as well in the context of Indo-China Border talks and various other articles related to Indo China relations including a recent issue when China raised its decibels on the Dalai Lama and even Manmohan Singh visiting AP. I am certain you will be able to verify every single one of this statements I make. So I really cannot figure why this blog post got written at all. What this blog post could’ve been is to point out that Google is not applying standards consistently. For starters the entire territory of China is disputed by Taiwan. Similarly many many other disputed territories eg. some between eritrea and ethiopia don’t show up as disputed. 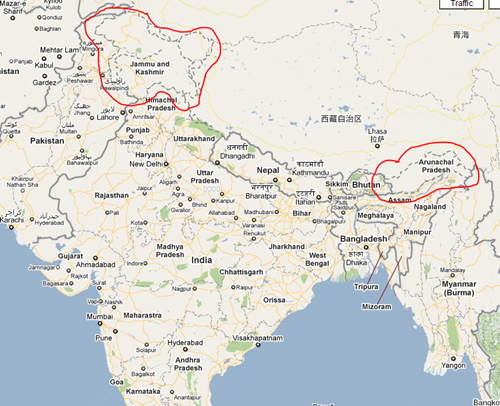 But I digress, cos this blog post is not about Google and China – its about the rendering of J&K and Arunachal Pradesh. Is Google showing Tibet as disputed? is Google showing any other parts of China as disputed? This reflects Google’s attitude! Joseph, I agree completely with you. China has stood firm against Google, infact, has gone ahead and even banned Google which has startled them. I think they dont want to be in bad terms with China. India should also take a stand, which will ensure that Google does not take us for granted ! Previously Kashmir and Arunachal Pradesh are shown as disputed area only to the maps users who are accessing it from outside India. If it is shown even to the Indian users, India should take a severe action against google. I feel Indian govt. will not take action like Chinese govt. against google and muslim countries against FB. Because Indian govt. always needs some issues in border matter to do local politics. Its my opinion Google maps has to be banned in India for showing Kashmir & Arunachal Pradesh as an disputed area. Put this in the press (major dailies or Aaj Tak) and let’s see what the Indian government does. Google must be warned not to f*** around with the users from India. Where did their bravery go when the Chinese government threatened them?